I had a number of requests to look at the Raiders salary cap and contract decisions and since I find the Raiders a pretty fascinating team and this is an ultra slow time for contract news it seems like a good topic. For the second year in a row the Raiders were one of the bigger spenders in free agency so there is some concern with were this leaves them in the future when it comes to re-signing some of their own. Considering where the Raiders were just a few years ago it’s certainly understandable for people to be pessimistic, but it’s probably not warranted. For those of you who don’t remember the Raiders of a few years ago they were, by far, the worst managed team in the NFL. While most teams grew savvier working with the salary cap and contract negotiations the Raiders seemingly regressed. 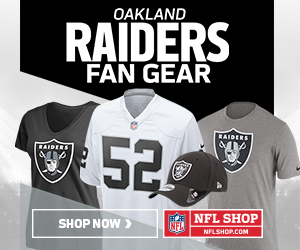 As teams began to better understand the benefits of the draft both on the field and on the accounting ledger the Raiders acted as if the draft didn’t matter. Money was thrown around like candy for aging veterans or “great athletes” who had some buzz. In general players were coming to Oakland not to win, but to build their retirement accounts. It is not an exaggeration to say if we wrote about the worst contracts and trades of the last 15 years, Oakland would probably hold 1/3 of the spots on the list, maybe more. The Raiders hired Reggie McKenzie as general manager in 2012. It was the worst job in the NFL. McKenzie took over a team with overpriced veterans and limited draft resources but one coming off an 8-8 record which inflated expectations. In McKenzie’s first year he attempted to deal with the situation and build around the monstrous contracts. They still restructured some deals for cap space and added a few pieces to the roster. The team crashed to a 4-12 record and McKenzie took one of the most dramatic steps in NFL history. In 2013 McKenzie essentially took a mulligan for the season, releasing most of the overpriced veterans and draft busts. They carried an absurd $55 million in dead money, about 45% of their salary cap limit for the season. The number was $20 million more than the next closest team and about $35 million more than the team with the 3rd most amount of dead money. The Raiders effectively were an expansion team, but given the state of their roster they really had no other choice. They needed to do something dramatic to turn things around. The team would win just 3 games in 2013 and 2014 and McKenzie made a number of really questionable decisions. They traded away veteran Carson Palmer over a contract issue and then traded for eternal bust Matt Flynn to play quarterback. His first ever first round pick was used on DJ Hayden, a pick widely panned at the time and even more widely criticized when Hayden actually took the field. For the most part his first two years of the draft provided the Raiders with little help. McKenzie also took an odd approach in free agency in 2014. The team was expected to be players for big free agents but instead it was mainly using money on old players nobody really wanted and were all on their last legs in the NFL. Justin Tuck, Antonio Smith, LaMarr Woodley, James Jones, Maurice Jones-Drew and another QB disaster in Matt Schaub. They were left with egg on their face when they dinged Rodger Saffold for an injury at the last minute after they allowed Jared Veldheer to walk away. They seemingly made a mistake with their contract for Austin Howard, the lone young player of note they signed that year. It was a miracle that McKenzie survived those first few years. If there was one thing that came out that was positive, though, it was that McKenzie was seemingly carving out an organizational philosophy for the team. Though the acquisitions were questionable it was clear that McKenzie was setting guidelines for his contract negotiations. Despite a few hiccups here and there the team was going to be committed to an all cash contract philosophy that would never have the Raiders feel the same pinch of the past from excessive signing bonus money. Incentives became a regular part of a contracts to maintain performance levels as were offseason workout bonuses and many contracts with per game bonuses. When it comes to running a successful franchise in the front office I think one of the most important things for a team is to have a firm philosophy when it comes to contracts. When you manage haphazardly things can get out of control. Agents take advantage of the situation and in a negotiation you have little to fall back on since an agent can find plenty of examples of contracts you worked on that fit various parameters. Oakland was now at least setting a tone with their negotiations. Of course what really saved McKenzie was the 2014 draft. To survive in the NFL you need a little bit of luck and he got it that season. With the 5th pick in the draft he nabbed Khalil Mack who would be one of the best rookies of the season. I’m not sure that one was luck as much as it was just the way the draft turned out, but the real savior for him was QB Derek Carr. There were two or three hurdles for McKenzie getting a quarterback in 2014. After Blake Bortles was off the board, Oakland picked behind both Houston and Cleveland that year, two teams in desperate need for a QB. There were also rumblings that the Vikings were ready to move up and select a quarterback at the tail end of the first round. The Browns dropped first with a stunning selection of Johnny Manziel with the 22nd pick, who many did not even regard as a first round pick. That took one team out of the mix. Houston passed on Bortles with the first overall pick to select a “once in a lifetime” prospect in Jadeveon Clowney, who has been anything but, and it seemed inevitable that they would take a quarterback to open the second round. Maybe their focus was on Teddy Bridgewater who was expected to go high in the first, but the Vikings made the move to get ahead of Houston and take Bridgewater with the last pick on day 1. Houston bypassed QB and grabbed Xavier Su’a-Filo to open the 2nd round. On another day it may not have been the case but on this day Carr was there for Oakland. Though the Raiders continued to struggle in 2014 and McKenzie ended up firing their head coach mid-season perhaps as a matter of self-preservation, Carr looked good enough at times to where it was difficult to justify letting McKenzie go. By midway through the 2015 season it seemed clear that McKenzie would have more leeway to improve the team now that there was promise being shown from Carr and Mack. This entry was posted in Contracts and tagged oakland raiders. Bookmark the permalink.